Blizzard Watch "WoW" Category - A news site dedicated to all Blizzard Entertainment news. Wowpedia - A huge wiki for everything World of Warcraft related. Also handles anything Warcraft universe related. Wowhead - An expansive database on anything that can be found or used in-game. Has a clean interface. Statista - A ranking on the distribution of characters across EU and U.S. realms. Other statistics on World of Warcraft accessible. Curse and WoWInterface are both great addon sources. Expansions are available on DVDs. First 20 levels are free to play. Subscription includes The Burning Crusade, Wrath of the Lich King, Cataclysm, Mists of Pandaria, Warlords of Draenor and Legion expansions. All versions require Battle.net DRM and a constant internet connection for all game modes. The playable characters from all expansions are available, even if the player has not bought any expansion packs. Available for free. Included with all full versions of the game. Can be bought from the Battle.net store. 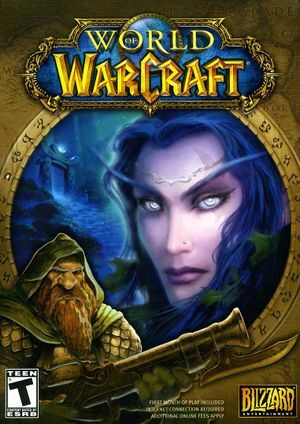 The World of Warcraft Starter Edition is a free but limited version of World of Warcraft. Characters can be created and leveled up to 20, and professions to 100. Each character can earn up to 10 Gold. Cannot access expansion zones or quests, join guilds, hold Pet Battles, or use the Auction House. All achievements and progress carry over to the full version. FXAA, CMAA, MSAA and SSAA. Frame rate is capped at 200 FPS. Go to Menu, then Interface. Choose Accessibility, then enable color blind mode. Can be changed using the Mouse section of the Interface menu. Use ConsolePort and follow the instructions for your type of controller. Master, sound, music, ambience, dialog. EAX 3. XP compatibility mode is also required from Vista onwards (besides DirectSound3D restoration). enUS, enGB, enCN, enTW available. The window size can sometimes not be changed by dragging after entering windowed mode. World of Warcraft might run sluggishly on older-model Macs despite having the required specs. Install a Windows partition using Boot Camp. If the machine overheats during gameplay, the sound can become distorted, which causes the framerate to fall dramatically. This issue only seems to occur on older MacBooks (PowerBook series, early MacBook series). Shut off the sound by going into the settings and removing Master volume. Change the setting (whether on or off). Use Alt+F4 to forcibly close the game. Re-open the game and the new setting should be saved properly. Open the Xbox app (search for Xbox and you'll find it). Click the settings button that looks like a gear. It's at the row of buttons on the left of the screen, all the way on the bottom. Click "Game DVR" on the top of the screen. Turn the Game DVR off. This should let you play World of Warcraft again. 11, 12 Previously contained Direct3D 9 and 10 modes until January 2018. Direct3D 12 is available for both Windows 7 and 10. 64-bit only as of patch 8.0.1. A comparison of each setting is shown in this video. DirectX 11 can significantly boost performance in some scenarios. Windows Vista without Service Pack 2 will be able to run the API, but it will only use shader model 4.0. Right-click on the shortcut you use to start WoW and select "Properties". You should see a target line in the new window that is already highlighted. Add -d3d11 to the end of the Target. This tweak seems to improve peformance for some. Only works when running d3d9ex. Restart the game for change to take affect. 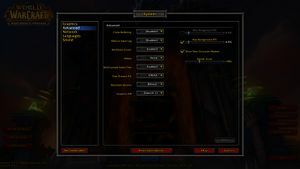 World of Warcraft's UI is developed via Lua scripting, and XML data. AddOns are essentially mods, files to add to the installation folder that can improve interaction with the game. AddOns are generally self-contained User Interface (UI) modification components. However, some AddOns can be dependent on other AddOns to work, and some AddOns are actually collections of other AddOns. Some are built on libraries such as Sea or Ace. There is no size restriction on AddOns; some can grow to be quite massive. 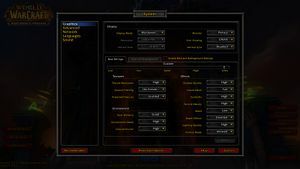 With the release of Patch 3.1, Blizzard Entertainment introduced a new UI AddOn development policy. According to the policy, "failure to abide by them [these rules] may result in measures up to and including taking formal legal action." AddOns must be free of charge. AddOn code must be completely visible. AddOns must not negatively impact World of Warcraft realms or other players. AddOns may not include advertisements. AddOns may not solicit donations. AddOns must not contain offensive or objectionable material. AddOns must abide by World of Warcraft ToU and EULA. Blizzard Entertainment has the right to disable AddOn functionality as it sees fit. Create a new directory in Interface\AddOns. The name of this directory is important, as it is what other AddOns use to refer to this AddOn in dependencies. Using version numbers in this directory name is not recommended, as other AddOns may "break" when the version is changed. Create a .toc file. .toc is short for "table of contents". A functioning AddOn will need a file named <YourAddOnDirectoryName>.toc in "Interface\AddOns\YourAddOnDirectoryName\". Add the following required elements to the file: an interface keyword with a correct interface number and the name(s) of one or more files to load. Blizzard requests that at least these five client-recognized tag lines must be included. <API_LatestInterface> is the current interface number. Do not have any extra spaces at the end of the line with the filename specified. The extra space is taken as part of the filename and will cause the AddOn to fail to load silently. The .toc file is not reloaded when the UI is reloaded; if changes are made to it, the game must be closed to the desktop before those changes can take effect. The interface number in the .toc file must match the current build or the AddOn will not be loaded/active, unless the user has explicitly told the game to load out-of-date Addons. If the .toc file declares an interface number prior to 2.0.0 (i.e. 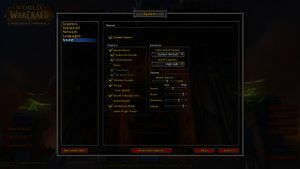 pre-The Burning Crusade), the AddOn can not be loaded, regardless of the load-out-of-date AddOns setting. If a Bindings.xml file is included, it does not have to be included in the .toc list of files to load, as the game loads this file automatically. This file is used to set key bindings specific to the AddOn. Please check out The TOC Format for a more detailed list of other keywords in the .toc file. As of Patch 2.3, if the message "Interface action failed because of an AddOn" appears, an AddOn interfered with the Blizzard UI in some way. Enter the following into chat: /console taintLog 1. Restart the game and try to reproduce it. If the issue is reproduced, quit the game and search through the file Logs\taint.log for the word blocked and mail the log to the author of the AddOn listed there. Turn off logging by entering the following into chat: /console taintLog 0. At the game's launch, the game also supported Windows 98, ME, 2000, and XP as supported operating systems. 98 and ME support were dropped with the 2.2.3 patch in October 2007, 2000 support was dropped with the 4.0.1 patch in 2010, and XP support was dropped shortly before the 8.0.1 patch at the start of 2018, along with Windows Vista. PowerPC Mac support was dropped with patch 4.0.1. This page was last edited on 19 March 2019, at 18:20.